Today I share a fact from the PCOS Nutrition Center. 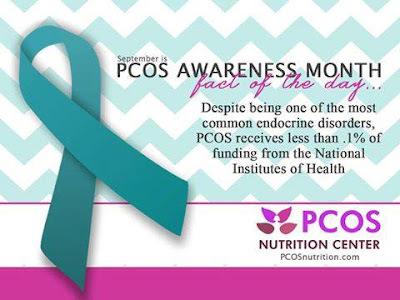 The fact that PCOS receives so little funding to study the syndrome makes it hard to understand, therefore it is commonly misdiagnosed. Before finding my doctor (who knew what it was right away), I went through so many tests because previous doctors did not connect the dots to all my symptoms. I was thought to have a hernia once, then it was celiac, then probably endometriosis. Cat-scans didn't show anything. Then I kept feeling like it was all my fault. It must be my shampoo that is causing my hair to fall out, so I bought something better. It must be the face cream I am using that is causing my acne, so I bought something different. I must not be exercising hard enough, so I would run an extra mile. All this pain is because I didn't stretch, so I took an extra yoga class. I am just emotional… ugh, whatever. It was exhausting. Then one day I experienced a doctor not believing the symptoms I was reporting. I felt so alone because no one knew what I was going through, even me. When I finally sat down with Dr. Lina Shammas, D.O., (Doctor of Osteopathic Medicine) after meeting her only once before, she pulled out 14 pages of blood work and said “I wanted you to come in because I want to tell you exactly is going on.” She drew pictures and went over numbers and explained to me how everything connected… everything. Then I started crying and she took my hand and said “You are not broken, you can do this.” She is so special to me because not only does she have the answers, she believes in me. We are fighting against low funds, so put in the effort to find someone who has the knowledge of the disease you are fighting. They are one in a million, but it is worth it. Don’t forget to love yourself, because you too, are not broken.